Chelsey's Closet was established in 2006 as a way to empty our daughters overflowing closet. We believe that everyone deserves to look and feel fabulous at affordable prices. One kid in college, and a second one soon! Jacket is a classic blue weathered stretch denim with bronze tone buttons down the front, collared neckline, top stitched seams, 2 front button down pockets, 2 slit pockets, and fitted seams. Long sleeves have two-button cuffs. It looks new. The colors are bright and the sequins add sparkle. The floral pattern is cheerful and spring like. 23" shoulder to bottom. 23" across bottom. BOB MACKIE Wearable Art. Length: 27”. Sleeve: 19”. Embroidery: 100% Polyester. Size 3 Chico's Designs Blue Embroidered Silk Jacket. Intricate embroidery and applique. Wool Blend. Does not diminish the overall appearance of the item.Very Good - Well-maintained. Shows minor signs of wear that are consistent with light use.Good - Shows signs of regular use. Item shows visible wear.Fair - Heavily used. 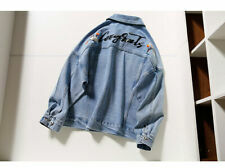 Sugar Lips White Denim Jacket Embroidered Floral Design Size. Condition is Pre-owned. Shipped with USPS Priority Mail. Seven embroidered patches throughout jacket. -Elastic banded wrist cuffs and waist. -Two front lined snap pockets. -Jacket is fully lined. -Jacket is lightweight and slightly puffy, not bulky. -Flat waist 21". Laura Ashley Embroidered Floral Button Jacket Pink Women's Plus Size 1X. Condition is Pre-owned. Beautiful easy to wear jacket. Lovely pattern and cuffs add a little something special. Bust 23” armpit to armpit. Sleeves 25”. Pit to Pit-24". Green Open front. Beautiful all over embroidery. BOB MACKIE Wearable Art. Size: Large. Sleeve: 24.5”. Exclusive of Decoration. Body: 100% Silk. Bob Mackie Fleece Jacket Womens 2XL Wearable Art Coat Blue Floral Embroidered. Condition is New with tags. Shipped with USPS Priority Mail. Beautiful Embroidered Thread Pattern Throughout. Jacket is fully lined with polyester. CAbi Womens Zip Hoodie Zip Up Jacket Embroidered Lightweight jacket. Size medium No rips Does have stain on the hoodie Zipper works fine Condition is Pre-owned. Shipped with USPS Priority Mail. Background color is gold/tan with muted green/blue stripes and embroidered roses throughout. False pockets on front. Sleeves have a slight flare at the end. A few areas of discoloration, spots - picture 9 is on the front, picture 10 is on one sleeve and picture 11 is on the back. Condition is Pre-owned. Brown Tank Included. Length 22". Lined in 100% rayon. Length: 33". However, this color and size combination is sold out. Features: Body lining, quilted shawl collar, front seam pockets, button-front closure, long sleeves, straight bottom hem, extra button, 100% polyester, machine wash, line dry. I an not a LuLaRoe consultant. This style denim jacket runs small so if you wear a 2XL you should get a 3XL. 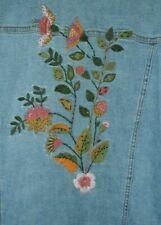 New Ruff Hewn Floral Embroidered Denim Jean Jacket Size Medium. Condition is New with tags. Shipped with USPS Priority Mail. It is embellished with embroidered scrolls, tea stained look crocheted lace trims, and distressed looking contrasting fabric. There is a stand-upMandarin style collar. Sleeve length from top of shoulder seam to bottom hem 23”. Fabric and care: Shell is rayon with silk inserts - lining is polyester. Dry clean only. Features: Heavily embroidered with silk inserts, lined. Sleeve from pit to cuff: 11.5". Armpit to armpit: 21". Bob Mackie 1X Wearable Art Embroidered Full Zip Fleece Jacket in Tan Black & Gold. Pre-owned and in Great Condition. Measurements- 25" armpit to armpit, length 28" and 24" sleeve. Shipped with USPS Priority Mail. Danbury Mint Fleece Bassett Hounds Jacket Embroidered Women’s Sz Large Grt Cond. Danbury Mint custom fleece jacket with embroidered Bassett Hounds on chest and across back. Cute details include 🐾 paw print zipper pull, zippered side pockets with paw print zipper pulls, toggle waistband, and zipper arm pocket. Chico's Navy Blue Embroidered Jacket Chico's size 2. Hook ans Eye Closure 24"Length. Brand new without tags Bob Mackie Embroidered Button Down Jacket. The buttons could use a bit if extra thread. Size M 21" armpit to armpit 26" length 18" sleeve length (Measurements are taken on a flat surface) Please check measurements carefully...all measurements vary depending on the brand. Please see all photos or ask any questions before buying or bidding.